PRODUCT: MODEL AB202A, SELF CONTAINED 1350 CFM, FLAT SELF-FLASHING, 20 Watt, SOLAR POWERED ATTIC VENTILATOR FAN KIT WITH THERMOSTAT. PAINTED FINISH. LIFETIME WARRANTY. PRICE/KIT. PAINT SELECTION: Attic Breeze models AB-202A is available with a painted finish in gray, black or brown. 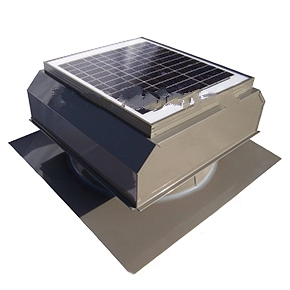 CONSTRUCTION DESCRIPTION: The Attic Breeze solar powered attic fan is the most powerful fan available. It vents up to 1350 CFM. It is constructed of heavy duty components that include a 25 Watt photovoltaic module, all steel heavy-duty base and shroud cover, 28V D.C. fan motor, 14 inch 5-blade assembly and rodent guard / bug screen. AIR INTAKE REQUIREMENTS: The manufacturer recommends 1300 Sq. Inches intake for optimum performance. WARRANTY: Manufacturer provides a LIFETIME product warranty. A mail in warranty registration card is included with each unit.